David Fichter, a muralist, transforms student artwork into colorful collages and often uses Dibond aluminum composite material in the process. Three projects stand out near the artist’s hometown of Cambridge, Massachusetts in which Fichther worked with young artists to create the fantastical community murals. One mural, spanning 36 feet, features elements characteristic of the northern coastal town of Ipswich, Massachusetts. All the students in the kindergarten through fourth grade school contributed to the theme, “Habitat of Ipswich.” The mural resulted into a whimsical panorama of salt marshes, gardens, forests, and all the critters and children to accompany such lush scenery. Bright greens and blues contrast kids shown kayaking, camping, and climbing to create the playful mural using acrylic paint on a Dibond aluminum substrate. 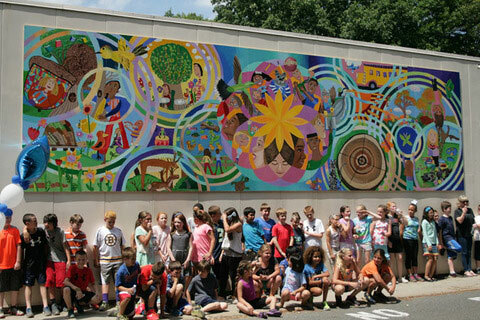 Next, David Ficther completed a mural based on the theme of growth, change, and evolution for Ivan G. Smith Elementary School located in Danvers, Massachusetts. While the school is a little farther south of Ipswich and located inland, the school backs up to a wetlands nature preserve. Influences from the natural surroundings can be seen making their way into the mural throughout. Students created the drawings that Ficther would weave together into the mural design with the theme of growth and evolution. Concentric circles give the mural movement, while the student’s creations can be seen framed at each center. The overall design takes on a movement of its own. 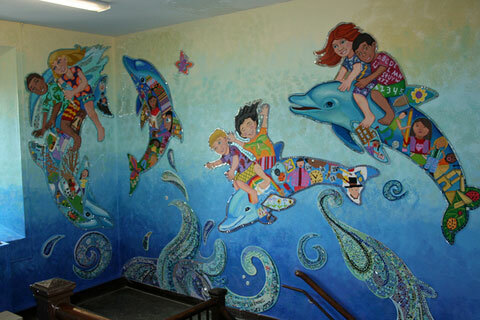 Our favorite of the painted murals is the one done for Ward Elementary School in Newton, Massachusetts using Dibond cutouts. Three walls of a stairway landing become a seascape of dolphins swimming and jumping out of ocean waves. Each dolphin takes on significance by representing a specific grade level. Within the body of the dolphins, a collage of student created artwork is framed. 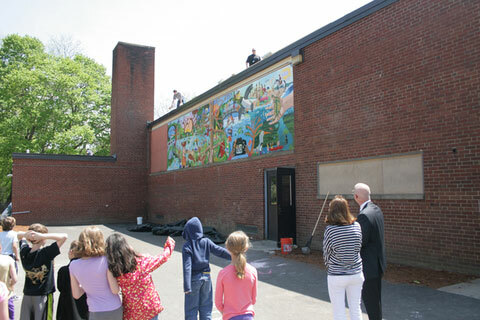 The students were given a special day to help participate in painting the mural. The Harvard trained artist, David Ficther, is a seasoned artist of community murals with 30 plus years creating public art all over the United States and various other countries. He is accustomed to working with youth on hundreds of permanent mural projects. It just so happens that often the artist’s material of choice for community murals is the durable Dibond surface that is excellent for acrylic painting and mounting.